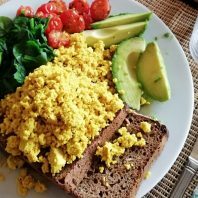 Scrambled tofu is an easy win if you want a protein hit. And tasty. You can serve it old-fashioned style with baked beans for a tin, or really nice is with steamed pak choi (or spinach, broccoli spears) and fried off tomatoes in oregano – as in the picture. Tofu is a complete protein, meaning it offers all the amino acids humans require, at a rate of 36g/100g. It also contains a range of minerals. Yoga-wise, it’s not 100% perfect as it is a fermented product, but occasional eating is fine – see veganyogi. It’s also a heavy and cold food, meaning you need good digestive fire for it. Adding the aromatic oils from mustard seeds and turmeric, as in this recipe, helps. Soya is a controversial food for environmental reasons; slash and burning of primary rainforest is still going on but this is generally to provide feed for beef. There is GM soya production on quite a large global scale, also for beef. Buy organic tofu to be sure it’s not GM. Health-wise there seem to be a range of studies pro and against soya and its oestrogenic properties. It may or may not suppress/promote certain cancers. turn the tofu for 5 minutes or so, meanwhile making your toast.